Midnight on a school night isn’t an ideal time for a gig, so when you do drag yourself in at that hour you’re hoping the band make it worth your while. That is where I got lucky, as The Crane Lane on Cork’s Phoenix Street had two cracking bands on display last Thursday night. Opening up proceedings were relative unknowns, Black Pope. This rock and rolling 4 piece are comprised of a trio of Cork musicians and ably led by a charismatic, County Clare man on lead vocals and guitar. Their lyrically dark take on classic rock and roll was thoroughly enjoyable and it had the majority of the late night revellers on the dance floor. From their nine song set, ‘Demon Stomp’, ‘She’s alive’ (complete with the lead singer convulsing on the ground in the midst of the crowd while wearing a white, dinner jacket) and ‘Most Exalted Potentate Of Love’ were all excellent, but the stand out was their stonking cover of The Stooges ‘I Wanna Be Your Dog’ which ended with three of the four band members in the crowd. The Fontaines, who have been championed by Today Fm’s Paul McLoone have been causing quite a stir in recent weeks. In particular, the lead vocalist has been praised for singing in his own inner-city Dublin accent and has even been mentioned in the same breath as Messrs Kelly, Drew and Dempsey, while the band’s indie-rock, guitar sound is a throwback to the rock and roll of days gone by. 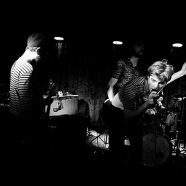 Tonight, Fontaines signalled their intent by starting off with the rip-roaring ‘Rocket To Russia’ which is the b-side to their excellent, debut single ‘Liberty Belle’. It was difficult to take your eyes from the stage as it appeared early on that anything was likely to happen. Within the first 10 minutes alone, the singer had dropped the mic stand into the crowd and not long afterwards he was unceremoniously, sent flying in the same direction. Luckily the songs were just as memorable as the onstage antics: ‘The One In Between’ and ‘Billy Was A Man’ were immense, While the song that drew such a crowd, ‘Liberty Belle’ was as expected the highlight of an excellent set.